So many people love eating oranges but are unaware of the benefits they are taking from it. Oranges are more than what we think. 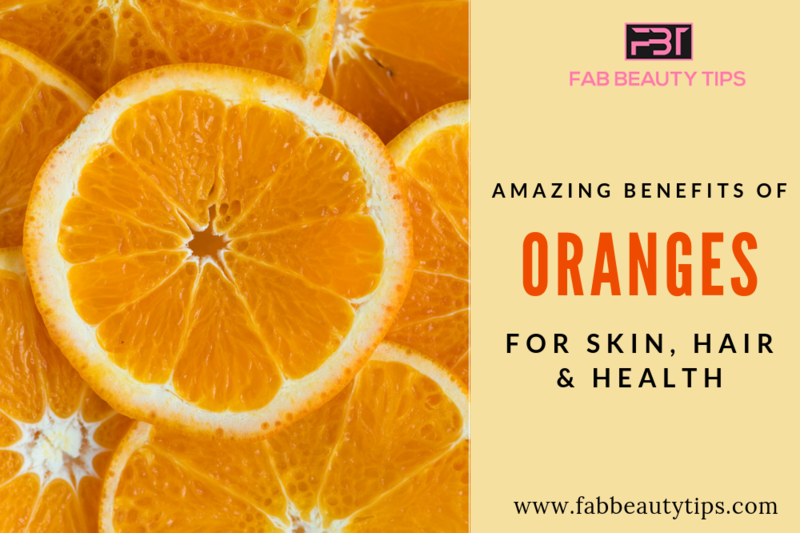 Using oranges for getting some amazing benefits for the skin and hair is always a good idea. Oranges are a great source of vitamin C and citric acid and these are necessary for everyone. So read the benefits discussed below to know all amazing benefits of oranges. Oranges are a good source of moisturization too. It helps the dry and dull skin to maintain the level of moisture in the body and on the skin. Using a pack made from orange peel and raw milk will help you in achieving in soft and moisturized skin. Oranges are the good source of vitamin C and this essential vitamin helps in fighting against the free radicals. Free radicals make the appearance of the wrinkles and fine lines fast and make a person look having dull skin. Oranges when used internally or externally fight against the free radicals. Drink orange juice or just apply it all over the face and body it will help you in both ways. Oranges contain citric acid which helps in drying out the acne easily and effectively. If you are a person who faces lots of acne and no treatment is working, then try using orange peel powder to soothe that stubborn acne on your face or body. Mix some orange peel powder with curd and apply it on the affected area. You will see the results after a few uses. When there’s a question arises exfoliate your skin then we start thinking about the market made scrubs which have lots of chemicals in it. The chemical’s presence in the market made scrubs are harmful to the skin and it may lead to skin cancer also. So, avoid using market made scrubs and start using orange instead. You can use orange peel powder mixed with rose water or curd or you can also use orange juice in the powder sugar and exfoliate your skin with this. Vitamin C is high in the oranges and this vitamin is very essential for our skin to make it smooth and firm. The women who face the problem of dull and aged skin, try using this magic ingredient in the form of either juice or powder. It will help you in making your skin firm and younger. Oranges are the main source of vitamin C to get it directly. Orange juice or peel powder works as a natural bleach too. For this take a small amount of orange peel powder and add milk or curd according to your skin type and apply on the face and neck for at least 20 minutes and wash it off. Blackheads are a girl’s worst enemy after a pimple. It’s very irritating to remove them because it causes lots of pain and sometimes leads to skin pulling. But to avoid these things you can use orange instead of them. Make a mask of orange peel powder and curd. Apply it to the face in circular motion and wash it off after 15 minutes. If you are worried about which toner you have to buy that is free of alcohol and does not make your skin dry and flaky then try using a homemade toner made from orange. Take 200 ml of water and mix 1 tsp of orange juice in it. Mix it and transfer it to the spray bottle. A natural and chemical free toner is ready for you. Spray it on your face whenever you want. The presence of citric acid in the oranges help in minimizing the large open pores on the face. Mix some fresh orange juice with fuller earth’s powder and apply it on the face for about 15 minutes and wash it off. You can also use ice cubes made out of the juice of the fresh oranges. As we all know vitamin C helps in reducing the blemishes, dark spots and scars from the skin. Oranges have a high amount of vitamin C which helps in lightens the acne scars and reduce the blemishes presence on the skin. Drinking orange juice will help from the within to remove the scars. One common wish of every woman is to see that natural glow on the skin and if we say you can get it for a very little amount and almost natural then? Yes! You can get it for a very little amount just by taking oranges seriously. Using orange on a daily basis will solve your problem of how to get the natural glow. Apply a mask made from the orange juice on your face and neck or even on the full body and see the glowing skin. If you had been bitten from a mosquito then apply orange juice on it and it will soothe the skin instantly. Due to containing a high amount of vitamin C in it, this will heal every skin problem effectively. Another benefit of oranges is it helps in slowing down the process of aging in one’s life. If you have wrinkles or fine lines or you can see the signs of aging then start using orange powder and juice in your beauty regime as soon as possible. With the regular use of soaps, our skin becomes dry and dull. Orange works as a natural body cleanser and also remove the dull or dry skin. Use orange peel powder mixed with some coconut oil or curd and apply it all over the body and rub this gently. Wash it off with normal water. With the regular use of this, you will see the glow in your skin and also the softness. Research shows that oranges contain a good amount of calcium. Calcium helps in treating the itchy skin and remove the inflammation from the skin. Application of orange pack made from the juice or from the peel powder will help in soothing the itchy skin. Using a face wash is good but it became sin when the face wash making your skin dull and aged. Using homemade facewash made from orange powder or orange juice for washing your face daily will give you glowing, younger and beautiful skin. Oranges are great if you want to remove dandruff from your scalp easily and without any use of a chemical. Vitamin C present in the orange remove the dryness from the scalp which causes dandruff and gives a clear scalp and hair. It sounds weird but it is true that oranges are a great replacement of the market made and chemical based conditioners. Orange juice acts as a natural hair conditioner and makes your hair soft, frizz free and smooth. Rinse your hair orange juice, massage it for a few minutes and wash it off with water. Apart from removing dandruff and conditioning the hair oranges also help with the growth of the hair. Prepare a hair mask with orange peel powder and castor oil. Apply it and keep it for 20 to 30 minutes then wash it off with lukewarm water. Adding shine to the hair was a difficult task in the past but now it is so easy and with oranges, it will become tasty too. Vitamin C and other beneficial nutrients available in the oranges will make your hair shine naturally. Crush some oranges and make pulp. Mix any carrier oil in this and apply it on the hair and scalp for about 20 to 25 minutes. Wash it off with herbal shampoo and see the amazing shine. If you are a person who is fed up of your oily and greasy scalp and hair, then here is the solution for you. Take one orange and squeeze out the juice from it, now mix 1 tablespoon of lemon juice to it and apply it all over your scalp and hair. Keep it for 20 minutes and wash it off. Citric acid present in the oranges will soak all the oil and reduce the amount of oil on the scalp and hair. Ran out of shampoo and don’t have time for buying it, then go to the kitchen and find orange peel powder. Oranges tend to be the best hair cleanser for every type of hair and is all natural. Mix some orange peel powder with rose water and lemon juice. Cleanse your hair with this and see how it works best when your own shampoo. Smelly hair is a big NO. Citric acid works great for curing this problem in the human hair. Make an orange hair spray by mixing some water and orange juice in a bottle. Spray this concoction on your scalp and hair, massage for few seconds and you are good to go. There are so many hair and scalp scrubs are available in the market but expensive and you are finding the affordable one, so try orange scrub. Vitamin C and citric acid work best as scrubs and oranges have it in a generous amount. Use orange peel powder mixed with honey and do scrub in a gentle motion. Wash it off with lukewarm water. As the face acne, some people are also suffering from the scalp acne. Oranges are filled with citric acid which is very useful in treating the scalp acne. Orange juice or orange peel powder both work great for this problem and are easily available in the market. Oranges are rich in vitamin C and this vital vitamin helps in boosting the immune system of our body. This vitamin also helps with the curing of ear and nose infections. The skin cells get damaged and it tool long time if there is a deficiency of the antioxidants and vitamin C. Oranges are high in antioxidants as well as vitamin C. Drink orange juice daily for preventing the skin damage. Orange is proven to be the best snack for the diabetic patient. It contains fibre which helps the body to maintain the blood sugar level in the body. So, start eating oranges now and control the blood sugar levels easily. As we know vitamin C and E are essential for good eyesight. If you are suffering from some eyesight issues and wants to maintain the health of the eye then drink one glass of orange juice daily. Oranges contain a good amount of vitamin C and E and many more nutrients. The problem of constipation is really irritating and to get rid out of it include oranges in your diet. Oranges contain both soluble and insoluble fiber which helps in maintaining the function of the stomach smooth and easy. So, these are some benefits of oranges that are not hidden anymore. Apart from applying it on face and hair, drinking the juice frequently will add a cherry on the top in your beauty. Leave a comment and let us know how this article orange benefits will help you and also share this article with your friends. This is such an informative post. I knew about the benefits of oranges for skin, but was unaware of all the other pointers you have listed here. Thanks for sharing. Oranges are such nutritious fruits. They have excellent benefits for the overall health, and I got to know so much more about their benefits through your post! Oh I never knew that oranges heal mosquitoes bites and that they are great for hair. What a fab informative post you’ve written. Wow.. Orange is really a super food. I was not aware that orange has such huge benefits for our skin,hair and health.. Very much informative.. This is amazing to read such great benefits of organges. I love this fruit for its amazing taste. wasnt aware of its benefits to control sugar level and help in digestion. Great Post. Oranges are my all-time favorite, it instantly lifts my more. I never knew orange helped in to maintain the blood sugar level. A very informative post. Thanks for sharing. Who knew oranges have so many benefits? I know the nutritional benefits but didn’t know they are so good for skin. I am using it soon. I love to use orange as an exfoilater for my combination skin. It works great for my skin. Oranges have been a part of my skincare forever, I remember my mother forcing me to use these packs made up of orange extracts and peels and I did so much drama. But, I’m glad she made me do it.